When it first opened in 1912 for the Olympic Games, Stockholm’s Strand hotel entertained a kaleidoscope of Hollywood VIPs including Frank Sinatra, Audrey Hepburn and Swedish actresses Ingrid Bergman and Greta Garbo – her favourite suite looked towards the city’s Royal Dramatic Theatre. But, after a century, the grand pile in Stockholm’s city centre, just a short stroll from the old town, was in need of an update. Now part of the Radisson group’s upscale portfolio of properties, which also includes Arne Jacobsen’s Royal Hotel Copenhagen, the Radisson Collection Strand Stockholm – as it is now known – has just emerged from a stylish two-year top-to-toe overhaul. Local practice, Wingårdhs has been careful to maintain the understated design of Ludwig Peterson’s original no-frills architecture with the use of natural materials like marble, walnut, oak and leather in muted bottle green, maroon, and grey tones inspired by the colours of the buildings in the surrounding neighbourhood. Together, this has created a low-key canvas for standout details like the black and white geometric flooring in the restaurant – influenced by the Moorish style of the nearby shopping gallery Birger Jarlspassagen –modern furnishings from Michael Anastassiades’ Captain Flint floor lamp for Flos to Gubi’s Stay Lounge Chair by Space Copenhagen; and colourful pieces by local emerging artists like Klara G and Isabella Ståhl. 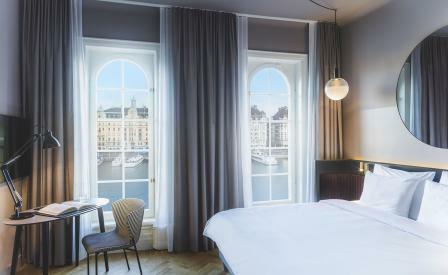 In the 170 guestrooms, a circular theme, with round mirrors and globe-shaped pendant lights by local outfit Zero Lighting, takes its cues from the original arched windows, which frame views of the harbour and, beyond that, the grand buildings that line Strandvägen, the city’s most prestigious street.